When your car is in need of repair or due for factory scheduled maintenance it is important to remember that you don't need to bring your vehicle to the dealership for service. You can save money and time by heading to a locally owned auto repair shop for dealer alternative repairs. Remember though, not all shops are created equal. To ensure that your vehicle receives the quality service it deserves find a shop that holds the following characteristics. By using a shop that is NAPA AutoCare Center your car is guaranteed to receive the finest replacement parts. 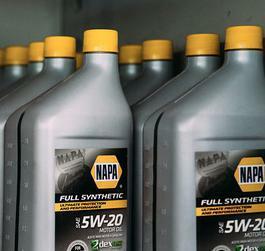 NAPA shops have fast access to OEM (Original Equipment Manufacturer) parts. Many shops use cheap aftermarket parts that can be risky to use when repairing or maintaining cars. The shop you select should also employ ASE Certified technicians. This means that the technicians have undergone certification by the National Institute for Automotive Service Excellence. To gain this the tech must have at least two years of professional experience and pass one or more qualifying exams. You should always be offered a warranty for the work done to your car. This is a way for a shop to show you that they believe in the work they have done, but should something go wrong, they will be happy to fix it on their dime. It's always a smart idea to check online customer ratings for any shop that you are interested in. This will give you a clear look at other people's experiences so that you know what to expect when you bring your vehicle there. Has the shop you're interested in won any local awards? This is also a great way to identify a trustworthy auto shop in your neighborhood. Anything from great customer service to best oil change will help you make a judgement about that auto repair business. When it comes to finding a dealership alternative in Mountain View head to The Car Doctors. We meet all of the above requirements and offer so much more. If your car is due for service we encourage you to read through more than 100 five-star reviews to see why we're a favorite for auto repair in Mountain View. Then give us a call at (650) 492-6853 to request more information or to make an appointment!